Egyptian Book of the Dead research papers overview the ancient Egyptian funerary text that was used from 1550 BCE to 50 BCE. 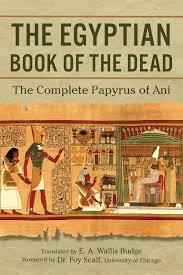 The Egyptian Book of the Dead is a great subject for a research paper in several types of classes. Certainly Egyptian history courses study the Book of the Dead and its place in history. However, the Egyptian Book of the Dead can be studied in several other contexts, such as religion, philosophy or even psychology. Paper Masters can custom write your Egyptian Book of the Dead research paper for you and explain the complex text often studied in Egyptian history courses. The Egyptian Book of the Dead is an ancient Egyptian funerary text, used during the New Kingdom Period (1550 BCE) up until the Roman occupation (50 BCE). The original hieroglyphic title best translates as “Book of Coming Forth by Day” and contains numerous magical spells that were supposed to assist the individual’s journey through the underworld after their funeral. Egyptian belief in the afterlife was a strong current in ancient Egyptian culture and one of the main reasons that bodies were mummified and buried with numerous objects. The spells that were compiled into the Book of the Dead were frequently from older periods, previously inscribed on tomb walls and sarcophagi. The Book of the Dead was often buried with the individual. The Old Kingdom: The earliest known spells date back to the Old Kingdom, part of the Pyramid Texts, which are perhaps the oldest known religious texts in history. These were carved on the walls of the pyramids and were intended for the exclusive use of the pharaohs. The Middle Kingdom: The Coffin Texts emerged, written on the inside of coffins. The New Kingdom: The Book of the Dead had emerged in Thebes. Many of the spells were written on the wrappings that covered mummies. Later, the spells were written down on papyrus scrolls. By the beginning of the New Kingdom period, the book was written in both hieroglyphics and hieratic script, which more closely resembles alphabet writing. There was no one single “Book of the Dead.” Rather, each one was created by scribes for the individual deceased. Egypt - The civilization of Egypt lasted for more than 5,000 years with Egyptians who were masterful scientists and mathematicians, and extremely skilled and gifted morticians. Death Research Papers discuss the different aspects death that relate to college courses. Funeral Practices Research Papers discuss funeral practices of many different religions from their beginnings to present. Order a research paper on funeral practices from Paper Masters. Ancient Death Rituals Research Papers - From the presence of these objects at Paleolithic burial sites, archaeologists have inferred that these early peoples most likely believed in some form of afterlife. Egyptian Classes in Society Research Papers delve into the different social classes in ancient Egypt. Paper Masters writes custom research papers on Egyptian Book of the Dead and overview the ancient Egyptian funerary text that was used from 1550 BCE to 50 BCE.